The Solo DC Output Max 90W Tested for 2015 to 2006 Apple Macbook Pro Air (Retina and older Mac Laptop Models). Charges for MacBook Pro 1.5 times, iPad Mini 1 approach 4 times, iPhone 10 times, Recharges in around 3 hours via adapter (included). 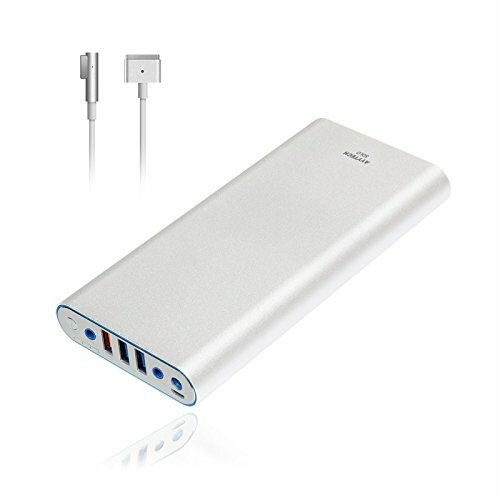 Packing: 1xAYYTECH Solo 40000mAh Powewr Bank(Silver), 1xMagsafe 1 Charging cord,1x Magsafe 2 Charging cord, 1xFast Charging Adapter, 1x US Power Cord,1x Protective Pouch, 1x Manual. Warranty: 30 days money back or exchange, free 18 months warranty. If you have any questions about this product by AYYTECH, contact us by completing and submitting the form below. If you are looking for a specif part number, please include it with your message.